On Monday, April 14, 2014, The Nathan Chris Baker Foundation granted our first Day of Greatness to Harry O’Sullivan from Sykesville, MD. Harry has been resilient in his fight with cancer while maintaining his positive and upbeat attitude over the last year. Harry is heavily involved with the local community and is a devoted Ravens fan. He and his wife Audrey have been Sykesville residents for the past 27 years. Yesterday, Harry and his three sons Patrick, Brian, and Chris were able to spend a GREAT day together. A limousine took them for lunch at EW Becks and then they were treated to a private tour of the Under Armour Performance Center and even met Head Coach John Harbaugh. Harry shared last night a statement that blew us away, “When Patrick Gleason, our tour guide, jogged out onto the field to tell Coach Harbaugh about me being honored by The Nathan Chris Baker Foundation...that was the best...then coach asked me about my disease...and I told him...Coach looked me right in the eyes and told me – you are going to beat this...if I was not pumped already that put me over the top”. A special thanks to Ravens Nest No. 14, especially Mike Naused who nominated Harry, and to Tony Lombardi from Pro Football 24×7 and the Russell Street Report, who helped arrange the tour. We also want to thank Patrick Gleason of the Baltimore Ravens who worked with us to make this day special for Harry as well as all the other Raven players and coaches who took the time to talk with them today! EW Becks is one of Harry’s favorite places and they worked hand in hand with us to make this day special for them. Lastly, we truly appreciate the courteous and prompt service from Bayside Limousine. You all played a special part in making this A GREAT DAY for Harry! We hope that this day was just what Harry and his family needed. We are over the top excited to put this great idea into action and so pleased to see smiles on Harry and his sons faces! What a GREAT first Day Of Greatness!!! If you know of an individual or family who you would like to nominate for a Day Of Greatness please email us your nomination at GoOutBeGreat@nathanchrisbaker.com. Prior to Harry's cancer diagnosis we were unaware of the Nathan Chris Baker Foundation. This wonderful organization entered our lives when Harry was awarded the honor of being their very first recipient of a "Day of Greatness." At that time we weren't sure where our journey would lead us but were hoping for the best. As my son Brian said, "it gave Dad a huge shot in the arm, a day where he could forget about his upcoming surgery, relax and enjoy an event of a lifetime with his sons and close friends. Looking back, it also gave my brothers and me one last great adventure with our Dad, a day we'll always cherish." The foundation arranged to have Harry and our three sons picked up in a limousine which took them to lunch at Harry's favorite restaurant in Sykesville, E. W. Becks. From there they visited the Baltimore Ravens headquarters for a 2 1/2 hour all access tour of their facility. As a lifelong Baltimore football fan, this was a dream come true for Harry. 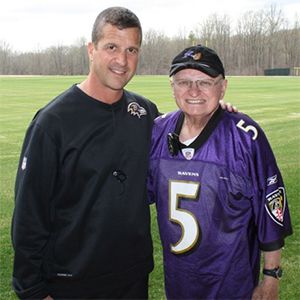 The highlight of the tour was meeting the head coach, John Harbaugh, who had some inspiring words for Harry and encouraged him to continue fighting. As my son Patrick said, "the Day of Greatness was the last thing my Dad would ever do with his three sons. I can't thank the foundation enough for providing such a great memory at a time when it was most needed. My family will always be grateful to the foundation for making this memory possible." Sadly, Harry's struggle ended three months later, complicated by other major health problems. To this day, family and friends often still talk abut that wonderful day, indeed a day of greatness! We are so happy that NCBF is enjoying such a presence and recognition in our community and my hope, and my family's hope, is that everyone who lives in the Eldersburg/Sykesville area will become aware of, and support, the wonderful work done by the Foundation. You will always hold a special place in our hearts and we wish you continued success. There is no better way to honor your son Nate's memory.